The first study for this drawing is in the AGNSW's Gleeson 'Sketchbook 3'. 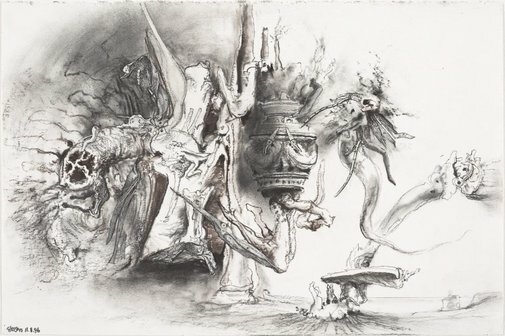 The detailed depiction of an ornate vase or urn at the centre of this drawing is transformed into an ambiguous organic form in the related painting. More commonly in his late work Gleeson collages such 'realist' elements, rather than draws them. Hendrik Kolenberg and Anne Ryan, 'James Gleeson: drawings for paintings', Art Gallery of New South Wales, 2003, pg. 117. Signed and dated l.l., charcoal "Gleeson 11.8.96".